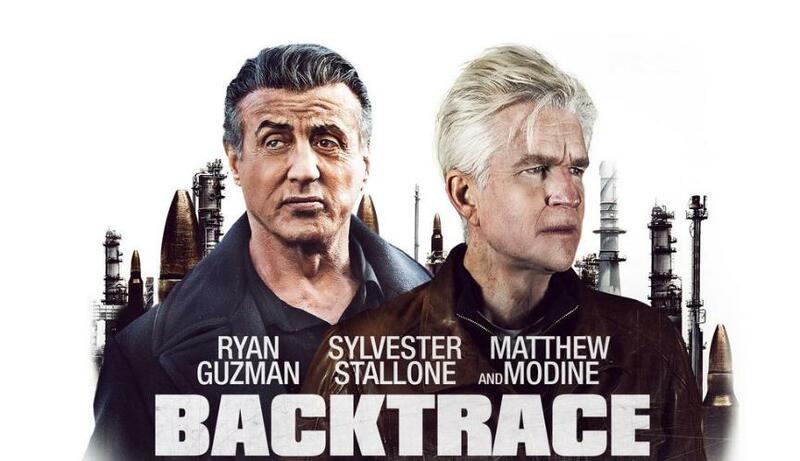 The producers for “Backtrace” would have us believe that it stars Sylvester Stallone, Ryan Guzman and Matthew Modine. They’re partly right as Stallone does appear, however his screen time doesn’t amount to much more than 10 minutes and most of that time comes during the end of the movie. Modine, who carries most of the movie, plays MacDonald, his background is never fully explained and we first meet him, along with two others, after they’ve robbed a bank of $20 million. The trio head to a meeting point where the plan is to meet up with two others and split the cash. Needless to say the meeting doesn’t go so well and MacDonald’s two partners end up dead and he ends up with a bullet in his head. We then move on 7 years and find that Mac Donald has survived and is now in a secure psychiatric hospital suffering from amnesia. Having been interviewed umpteen times by detective Sykes (Stallone) his amnesia means that he is unable to remember where he stashed the cash. Unluckily for MacDonald the police aren’t the only ones looking for the cash and he’s approached in the hospital by a fellow patient (Guzman) who tells him that he can get him out and that he can also help him to get his memory back. Helped by one of the security guards (Tyler Jon Olsen) and a nurse (Meadow Williams) MacDonald manages to escape. He’s then injected with an experimental drug which is hoped will jog his memory and help him remember where he stashed the millions of dollars that he stole. Closely pursued by Sykes MacDonald, who is left holding his head for most of the rest of the movie due to a massive headache caused by the drug that he’s been given, is then taken to familiar areas of his past in the hope that seeing places familiar to him will help bring his memory back. Modine plays the part well and try’s his best to do something with what little he’s been given, as for Stallone? He looks as if he’s just there for the money and looks totally disinterested whenever he appears on screen. Much like his fellow action stars from the 80’s and 90s, Arnold Schwarzenegger and Bruce Willis, if they’re not regenerating characters from their pasts for the big screen, their appearing in straight to DVD nonsense like this, their face on a poster and a 10 minute appearance duping us into believing that they’re the actual stars. As for the rest of the cast their acting ranges between okay (Guzman) and downright awful (Olsen & Williams). “Backtrace” is a B movie in every sense and doesn’t come with much to recommend it, at times it’s badly acted and the shootouts are more likely to make you laugh than gasp. The one thing that it does have in its favour is that director Brian A Miller manages to move it along at a fair pace, throwing in enough twists and turns to keep you guessing the outcome until the very end. That’s if you manage to get to the end as by then you might have given up and turned it off.